Cosmetic surgery is a competitive field with a rapidly expanding market across the nation. If your website isn’t actively helping you you attract potential customers, it’s time to make a change. Localmize works with cosmetic surgeons to create optimized websites that look beautiful, are easy to use, and improve the business’s overall online presence. Localmize designs, builds and hosts websites for cosmetic and plastic surgeons, with process that is focused on a generating new leads and attracting new patients to cosmetic surgery practices. The results for our cosmetic surgery customers have been outstanding; with their new custom websites from Localmize, they are now ranking at or near the top of Google search results for the most relevant keywords being searched by potential customers. The appearance of your website can set you apart from your competitors. That’s why Localmize never uses templates to build any of our custom websites. Our marketing team will take the time to learn the ins and outs of your business’s unique specialties, customer base and service areas, so that we can construct a website that truly reflects your goals and needs. Our website design process doesn’t stop at making your website look beautiful. We know that websites need to be easy to find, simple to use, and help generate revenue for you! An optimized website from Localmize indicates to major search engines like Google that your cosmetic surgery practice is a real, reliable business that offers valuable care and services. As a result Google will rank your business higher in its search results, making your business easier than ever to find for potential customers who are Googling your services. Our design process isn’t purely aesthetic, it focuses on driving web traffic and growing your business. Localmize offers a complete turnkey solution for cosmetic surgeons. Localmize built Pine Ridge Laser’s website to match their newly designed logo aesthetically, and helped the business highlight their specialities within the cosmetic surgery market. 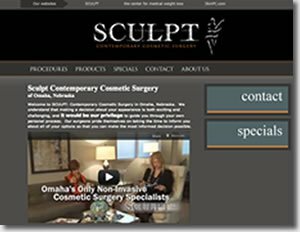 When Localmize designed Sculpt Contemporary Cosmetic Surgery’s website, the business was brand new. Their website was built to establish a clear brand and niche for the company with a competitive local market. Interested in our online marketing services for cosmetic surgeons? Take a look at our cosmetic surgery search engine optimization! Call 877-700-1990 to speak with a Cosmetic Surgeon Website Design expert.